In the fall of 2005, a band of researchers cracked the code of the chimpanzee genome and provided a startling new window into the differences between humans and our closest primate cousins. For the past several years, acclaimed "Science" reporter Jon Cohen has been following the DNA hunt, as well as eye-opening new studies in ape communication, human evolution, disease, diet, and more. 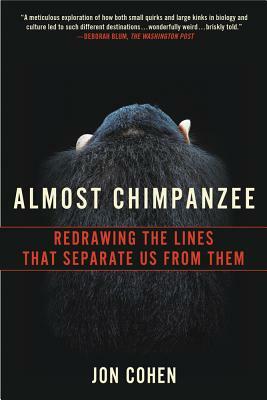 In "Almost Chimpanzee," Cohen invites us on a captivating scientific journey, taking us behind the scenes in cutting-edge genetics labs, rain forests in Uganda, sanctuaries in Iowa, experimental enclaves in Japan, even the Detroit Zoo. Along the way, he ferries fresh chimp sperm for a time-sensitive analysis, gets greeted by pant-hoots and chimp feces, and investigates an audacious attempt to breed a "humanzee." Cohen offers a fresh and often frankly humorous insider's tour of the latest research, which promises to lead to everything from insights about the unique ways our bodies work to shedding light on stubborn human-only problems, ranging from infertility and asthma to speech disorders. And in the end, Cohen explains why it's time to move on from Jane Goodall's plea that we focus on how the two species are alike and turns to examining why our differences matter in vital ways--for understanding humans and for increasing the chances to save the endangered chimpanzee.